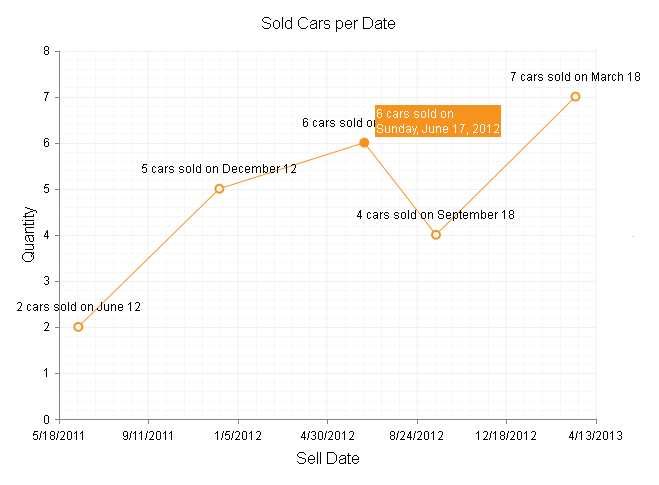 This Help article describes the Data Axis support in RadHtmlChart and provides a figure and example. As of Q2 2013, Date Axis support is available in RadHtmlChart, so that the chart can now be data bound to DateTime objects (see Figure 1) or their string representations. XAxis labels, series labels and tooltips can be formatted to the desired date format. Date Axis support is available only for a databound RadHtmlChart which automatically detects the DateTime object data in the column/field and adjusts the distribution of the items on the XAxis. The default base time interval for the Date Axis labels is determined automatically from the value range. The SeriesItems that are created appear over their corresponding date and respect the scale of the axis (items for dates that are closer together are plotted next to each other). The BaseUnit property controls the scale of the axis. The available options are "auto", "years", "months", "weeks", "days","hours", "minutes" and "seconds".This controls the time intervals though which a label is placed on the date axis. No prior data sorting is required for the data source. The Type property of the XAxis must not beset explicitly; otherwise, the dates will be converted to numbers. The type of the XAxis is controlled via its Type property which takes a string value of "Date" or "Category". See List 1 for more details on these properties. List 1: Description of XAxis Type - "Date" and "Category". The XAxis behaves like a Date Axis from a numeric series, so series items are created for their corresponding date. The default base time interval for the Date Axis labels is determined automatically from the value range and it can be controlled through the BaseUnit property. Available options are "auto" , "years" , "months" , "weeks" , "days" , "hours" , "minutes" and "seconds" . You can explicitly set the first and the last date to be displayed on the x-axis through the MinDateValue and MaxDateValue properties. The XAxis behaves like a Category Axis , so that DateTime intervals between the items are not taken into consideration and XAxis items are plotted on the XAxis evenly. A SeriesItem will be created for each entry in the data source and they will be placed in the order in which they passed. Thus, the data source may need to be sorted in ascending order to have the series items placed subsequently according to their date. Figure 1: Configuration of a Numeric Series (ScatterLine) bound to DateTime object data. Example 1: shows the simple markup used to configure a Numeric Series (ScatterLine) bound to DateTime object data in Figure 1.